OMG Posters! 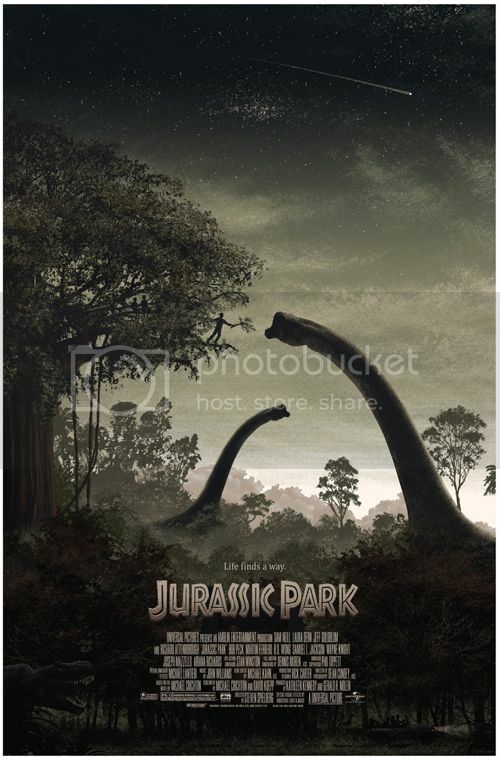 » Archive Jurassic Park Poster by JC Richard (Onsale Info) - OMG Posters! The second Jurassic Park poster from Mondo comes courtesy of the always-amazing JC Richard. It’s a 24″ x 36″ screenprint, has an edition of 375, and will cost $45. There is a ton of detail subtly hidden in this thing, it’ll be crazy in person. It goes up Thursday, October 27th at a random time. Visit Mondotees.com. I actually didn’t notice the gate until I saw the variant. Very cool. I’ll make a run movie poster. Where can I see a picture of the variant?? Meh, I just don’t want a Jurassic Park print. Though, I look forward to new prints for Mondo by JC. @Sonia – There are about 20 prints on ebay now. You can have one for the low, low buy it now price of $250. Missed out on this but they prices will go down for sure. Ebay hype. Cayman, they had to do a completely new set of screens for the variant, and the cost of that has to be spread out among fewer pieces. There were three times as many regulars to absorb the printing costs. I’m sad to have missed this one, but it would look great in my son’s room, so I’m off to eBay. Yeah. Missed it over here too. By the time I got to the site it was absolutely deadlocked. Bummer. Got them both, cant wait to see them in person.